Jake Dennis impressively stormed through the field to help the #3 Team WRT Audi R8 LMS to a ninth place finish in the second and main race of the Blancpain GT Series Sprint Cup event at Zolder in Belgium. The Racing Steps Foundation-backed driver, who suffered a tough result in the opening one-hour skirmish following a mechanical failure to his and team-mate Pieter Schothorst’s machine, were forced to start from 24th place on the grid. But Dennis was determined to make up for the previous day’s disappointment, and at the wheel for the first part of the race, he wasted no time in scything through the pack following an excellent start making up 11 places up to 13th spot after the opening 10 laps. Having made a brave move up the inside of the #19 Grasser Racing Lamborghini Huracan of Ezequiel Perez Companc, Dennis soon disposed of the fellow Team WRT #1 car of Enze Ide. With the #90 Akka ASP Mercedes-AMG of Michael Meadows collecting two drive-through penalties, Dennis was promoted to 11th place and handed over to Schothorst with 30 minutes remaining as the pit window opened. The fortunes of the opening half of the race were certainly different for fellow RSF-backed racer Ben Barnicoat and the #58 Strakka Racing McLaren 650 S GT3. Like Dennis, Barnicoat also began the race and made a good getaway from his 10th place to vault up to seventh place while under pressure from the #99 BMW of Antonio Felix da Costa, before the German was tapped into a spin by the #5 Team WRT Audi of Marcel Fässler. But Barnicoat’s race was to unfold quickly when he rode over a kerb at the Villeneuve chicane, damaging the left front side of the car and forcing him to pit. Further bad news followed. Race stewards’ deemed the car to have still been up on its jacks on the three-minute mark ahead of the race. A drive-through penalty was handed down, with Barnicoat and team-mate Alvaro Parente’s race ruined. Barnicoat was able to re-join the field following the two trips to the pit lane, but was forced to cede to blue flags and trail behind at the back of the pack before handing over to Parente with less than half of the race remaining. Following the Team WRT pit stop, Schothorst took to the track remaining in 11th place, but an incident involving cars ahead in the final 15 minutes, helped the Dutch racer into the top 10. The Mercedes-AMG cars of Jimmy Eriksson and Daniel Juncadella made contact, with Juncadella hitting Eriksson into the wall at the final corner while attempting to pass. The incident forced Eriksson to retire with Juncadella handed a 90-second penalty added to his race time, demoting him well outside the top 10 spots, and promoting Dennis/Schothorst to ninth place by the chequered flag. Parente managed to guide the Strakka Racing McLaren to the flag, but were forced to settle for 28th place. 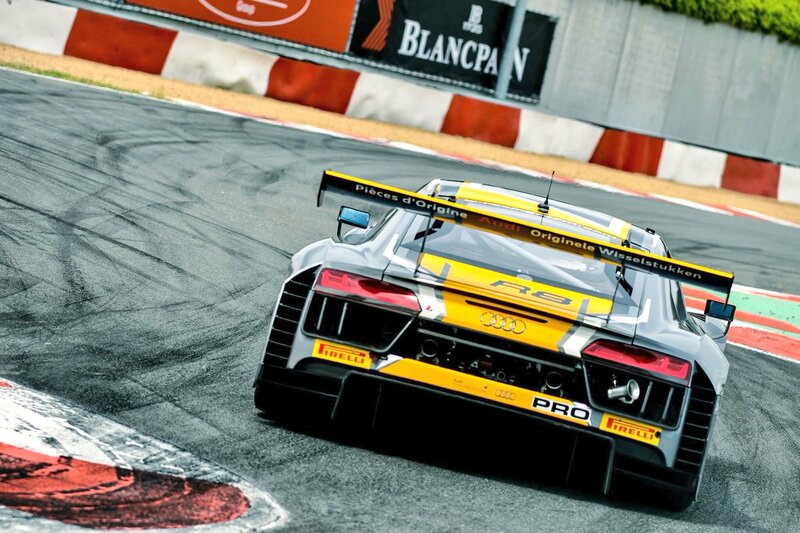 The fellow Team WRT Aud R8 LMS of Markus Winkelhock and Will Stevens scored their maiden Blancpain GT Series victory. They topped an all-Audi podium with the ISR pair of Clemens Schmid and Filip Salaquarda second. The race one-winning Team WRT car of Stuart Leonard/Robin Frijns took third.